“Man, Hell Yeah, Man” scheduled to take place October 19th, 2018! 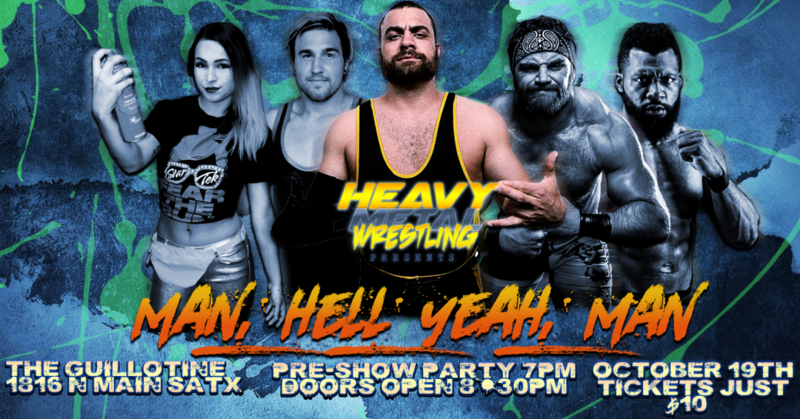 Scheduled to take place at The Guillotine (1816 N Main Ave, SATX) on October 19th – “MAN, HELL YEAH, MAN” is already shaping up to be another massive Heavy Metal Wrestling event. As announced at our previous event, the main event will feature “The King of Hoss Island” THOMAS SHIRE squaring off against current Impact Wrestling superstar – “The Last of a Dying Breed” EDDIE KINGSTON. After picking up a career-defining victory over PCO at our last event, Shire looks to ride a huge wave of momentum as he clashes with one of the vicious athletes around in Kingston. Plus, the Quarter-Finals of the Bexar Knuckles Championship Tournament is underway! Stay tuned for match announcements to follow! Main Event Announced for “Man, Hell Yeah, Man”! The Mad King set to debut!